Consumer preference or aversion to wines made from native grapes—such as Concord, Niagara and Catawba, which are grown in North America—may depend on early exposure to the fruits' sweet, ultra "grapey" taste and aroma, according to researchers who conducted sensory tests with wine drinkers in Pennsylvania and California. That strong grapey odor, commonly attributed to wines made from these Vitis labruscana grapes, is caused by the compound methyl anthranilate. It is widely accepted that wine experts and discerning consumers find these flavors objectionable in wines made from Vitis vinifera grapes, such as Pinot Noir, Cabernet Sauvignon and Riesling. Prior work suggests increased exposure to a food product can increase liking, noted John Hayes, associate professor of food science, Penn State, and director of the University's Sensory Evaluation Center. He pointed out that an increasingly competitive wine market is driving researchers to understand the many factors that influence customers' decisions to purchase and consume wine. "While many of these variables are dependent on marketing, there are intrinsic characteristics of the wine that influence purchase, and these vary among individuals," said Hayes, whose research group in the College of Agricultural Sciences conducted the study. "This research suggests that liking or accepting that 'grapey' aroma presented by native labruscana grapes may be a learned response." To judge "liking" for the odorant, researchers assessed the preferences of 47 wine drinkers in Pennsylvania, 48 wine drinkers in California and 37 wine experts in California through a series of taste tests. Participants were asked to choose between a relatively neutral Chardonnay and the same Chardonnay spiked with methyl anthranilate in six ascending concentrations. These concentrations were based on levels likely to be found in wines made from both native (labruscana) grapes and vinifera grapes. Consistent with the expectation that experts view native "grapey"-associated odors as a fault, wines with medium to high concentrations of methyl anthranilate approximating the intensity of the compound in Concord or Niagara wines were largely rejected by wine experts in California. However, non-expert consumers in California were more tolerant of methyl anthranilate. In comparison, non-expert wine consumers in Pennsylvania expressed little to no influence of added methyl anthranilate on their preferences. 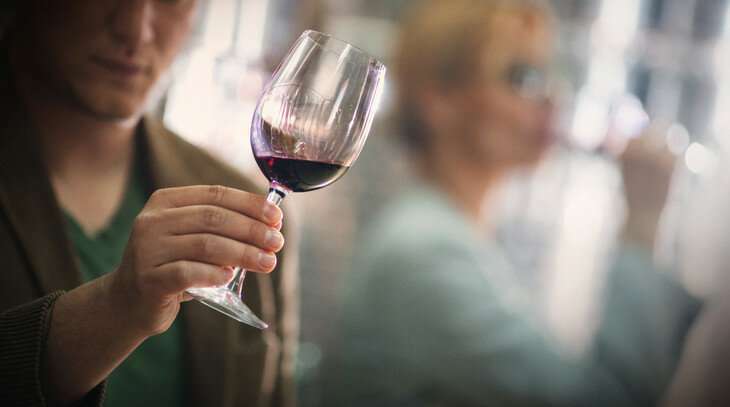 To gain insight into whether the liking of "grapey" aromas was learned, the researchers asked California and Pennsylvania consumers about their wine-consumption habits and wine interest levels. To estimate their familiarity and exposure to methyl anthranilate, the researchers asked all participants to self-report consumption of other related food products such as grape juice and grape jelly made from Concord grapes. It turned out that Californians had very little exposure to grape-flavored foods while Pennsylvanians were very familiar with grape flavors and had been exposed to them often. Lead researcher Demi Perry, a master's degree student in the Department of Food Science when the study was conducted, went to the University of California, Davis, to collect sensory data from wine drinkers and wine experts there, just as she did at Penn State's University Park campus. She believes the findings, which recently were published in Food Quality and Preference, demonstrate that Pennsylvania consumers are tolerant of the "grapey" aroma of wines made from Concord, Niagara and other labruscana grapes that consumers and wine experts in other regions reject. "While many experts report not liking wines that are 'grapey'—a term typically associated with wines made from labruscana grapes—such wines are widely found in the tasting rooms of many wineries in Pennsylvania, Ohio, New York and New Jersey, and drive profits for a substantial proportion of these states' wine markets," she said. "Accordingly, there appears to be a striking divide between wine experts and non-expert consumers in preference for or against wines vinified from labruscana grapes." The study's results support the notion that methyl anthranilate may not be undesirable, and may in fact be a flavor that is enjoyed by many Pennsylvania consumers, Perry added. And that's a good thing because native grapes are still, by far, those most commonly made into wine in the Keystone State. According to a recent Pennsylvania Orchard and Vineyard Survey, Pennsylvania has more than 350 commercial vineyards comprised of nearly 14,000 acres of grapes. The industry generates more than $15 million income for commercial vineyards. Concord grapes destined for the juice market account for 77 percent of total grape production. Erie County accounts for 72 percent of grape production in Pennsylvania. There are 1,800 acres of wine grapes in cultivation, making up 12 percent of the total production. Native American varieties constitute the vast majority of wine grape production—primarily Concord, but also includes significant acreages of Niagara and other varieties. I notice they totally ignored North Carolina wines.